Just what you have been waiting for in GATED GRAND HORIZONS... where you OWN your land in Sunny Florida! 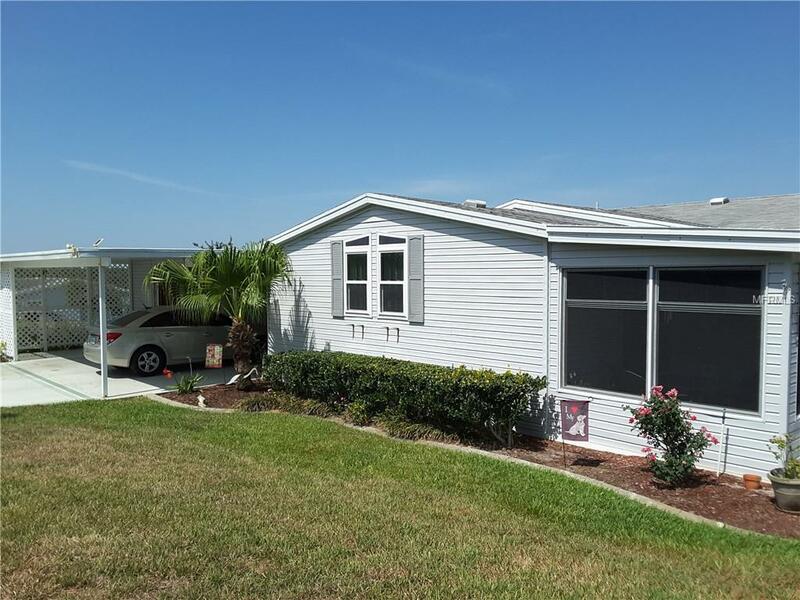 MUST SEE this UPDATED Triplewide situated on single corner lot with low HOA and no CDD fees. Great Curb Appeal with decorative painted driveway, landscape curbing, well manicured lawn, lattice patio and golf cart garage with workshop! All windows replaced with Double pane thermal windows plus newer AC for lower utility bills. Plenty of room to park your cars side by side on level driveway. Oval leaded glass door welcomes you to ceramic tile foyer into SPACIOUS living/dining room with transoms, column, wood laminate floors! New flooring throughout. Updated kitchen is a dream with custom wood cabinets, center island, desk area, stainless appliances, walk in laundry room/pantry and eat in area! Sliding doors to enclosed porch extend your living space! Outdoor patio is perfect place to grill and enjoy the warm breeze! Master suite has 2 large closets, bath ensuite with shower, dual sinks, storage closet on one end of home... secondary bedrooms and guest bath on opposite side of home for privacy. Large family/leisure room for watching TV is OPEN to the kitchen for easy entertaining. Enjoy the resident owned amenities: heated pool, hot tub, Commercial kitchen, craft/quilting room, library, billiards, planned activities & travel excursions in this Active 55+ community. Located within one mile of YMCA, shopping, grocery stores, Cinema, bowling, hospital & doctors. CALL TODAY to see why this IS the place to BE! Pet Restrictions No Exotic Pets See Grand Horizons Rules And Regulations Attached For Additional information information.